“What does it mean to put your employees first?” | UC Berkeley Student Affairs Community Blog! Recently, some of the GO BIG! staff team members attended the 2015 ENGAGE Conference. The focus was on employee engagement and why company culture is so imperative for the success of an organization. For us in Student Affairs, the same message can be applied. Happy Staff=Happy Students. Immediate action: ask your staff members how you can support them with any of their work during this time; ask how they are doing in different parts of their lives. Longer term action: hire people that are compassionate, empathetic, and authentic. Immediate action: send an email to a staff member who has a major milestone happening in their lives; thank them for the work they have continued to do simultaneously. Longer term action: Have an end of the semester celebration acknowledging each staff member’s individual major milestone; this can be personal or work-related. At Southwest, major life milestones for staff are celebrated or acknowledged by leaders in the company. Immediate action: commit to asking staff during a meeting or in your next 1:1 how they each connect to the purpose within Student Affairs. If they have difficulty seeing the connection, verbalize how their individual contribution is important to the department and division’s success. Longer term action: Hold a staff retreat where everyone works on their own personal purpose statement. Southwest maintains that they have a sacred responsibility to their employees to connect them to their higher purpose, while offering their customers a better way of how they do business. 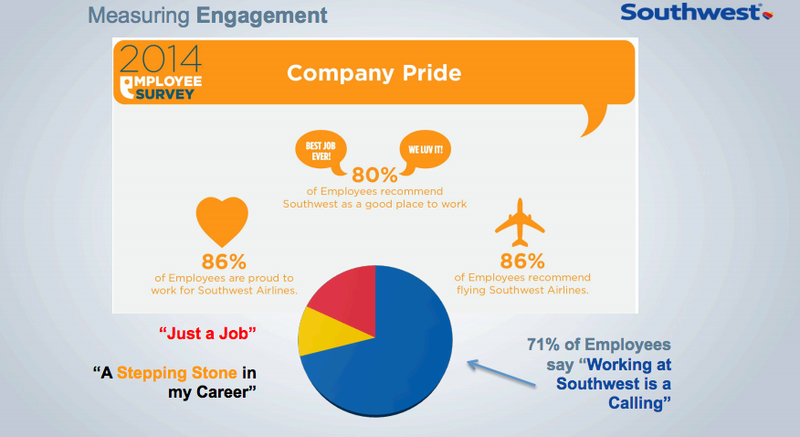 71% of Southwest employees stated that it was their calling to work for the company. Additionally, 86% were all proud to work for Southwest.